SMEs are the backbone of the Greek economy, contributing 87 percent of the workforce and 73 percent of value added. After many years of economic crisis, the long-awaited rebound of the Greek economy now relies heavily on the activities of SMEs, the growth of which will reduce unemployment, increase private consumption and benefit the country’s GDP. Nonetheless, Greek SMEs continue to face challenges, many of which intensified during the financial crash. Indeed, the recession affected SMEs far more severely than it did larger enterprises. Despite efforts to increase exports, the main activities of SMEs remain focused on domestic demand, which has unfortunately declined considerably in recent years. In light of SMEs’ importance to the Greek economy, World Finance spoke with Iakovos Giannaklis, General Manager of Retail Banking at Eurobank, about the sector’s challenges and how financial partners can help to overcome them. Eurobank was named best retail bank in Greece in the World Finance Banking Awards 2018, and has extensive expertise in supporting SMEs. 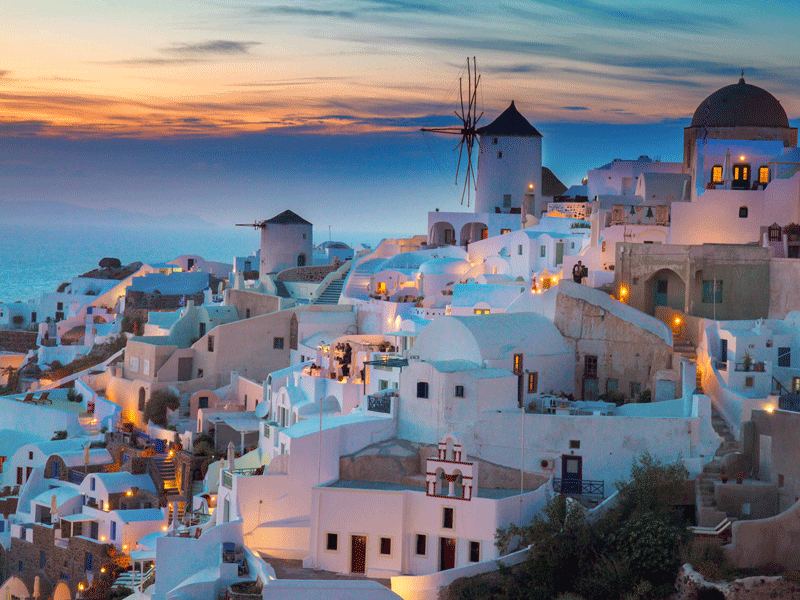 What are the most pressing challenges facing SMEs in the Greek economy? Competitiveness in the EU is high, with many businesses bringing agile, tech-based solutions to the market. Traditionally, Greek SMEs are family-run businesses, operating with high flexibility and low productivity. Due to their size and structure, they cannot afford to employ specialised staff in key positions. Meanwhile, the employment of digitalisation, modern management models and advanced banking solutions, all of which enhance operational efficiency, remains low among SMEs. At present, product output lacks technological content and, subsequently, added value. Finally, there is not a strong culture of business collaborations, and clustering remains fragmented, thus limiting potential success in big export markets. SMEs that managed to survive the crisis are a brilliant example of creativity, tenacity and business instinct, leading us to be confident that they will thrive as the Greek economy bounces back. What role does Eurobank play in the support of Greek SMEs? At Eurobank, we believe each customer is unique and has their own needs. Our small-business banking managers approach every client profile by responding to their individual requirements in order to develop a long-lasting and mutually beneficial relationship. Having consolidated high-quality client relations with the implementation of a horizontal service model, we have developed a concise strategy to help businesses overcome their biggest challenges. We provide requisite financing for working capital and investments in favourable terms. We also offer a holistic solution to businesses eligible for funding within the National Strategic Reference Framework. 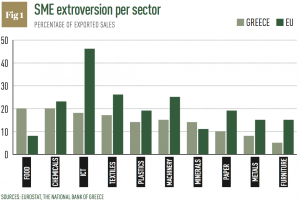 We promote extroversion; even though the number of exporting businesses has risen in recent years, the overall percentage remains extremely low (see Fig 1). We therefore need to encourage the business community to collaborate, participate in networks and look for new opportunities abroad. Finally, we encourage technological advancement through innovative solutions. In terms of products and services, we provide an integrated approach, offering tailor-made solutions to suit every client’s needs. Eurobank’s offering includes a wide range of specialised products. Taking advantage of state-of-the-art technology is also essential, so we offer the innovative ‘v-banking’ service – a first in Greece – which allows customers to communicate digitally with their business banking consultant. What financial tools does Eurobank offer to SMEs to boost their competitiveness? At Eurobank, we always strive to ensure that business financing has as few barriers as possible by approving seven out of every 10 requests. Our commitment is that we will find a way to fund all business plans with substance, prospects and a strong foundation. Meanwhile, to ensure low-interest financing, we offer programmes through collaborative agreements with national, European and international institutions, such as the European Investment Fund, the European Bank for Reconstruction and Development, the International Finance Corporation, the European Investment Bank and the Hellenic Fund for Entrepreneurship and Development. Furthermore, the relationship managers in Eurobank’s small-business banking division use tools such as the Business Check-Up, which allow them to determine a client’s strengths and weaknesses, as well as areas for improvement in comparison to their local competition. Having made this assessment, we then recommend the most appropriate products and services in order to manage coverage and securitisation against any operational risks arising from the client’s business activities. Essentially, we help businesses identify the banking products that cover all of their needs. We even compare the company with the rest of the sector in terms of key performance indicators. Finally, capitalising on our extensive experience as a servicing bank in previous cycles, we have developed a tailored solution for companies eligible to receive funding through the National Strategic Reference Framework. We offer free eligibility checks, which can be carried out in one of our branches or online, as well as financing for equity contributions and the option to collaborate with a leading financial consultancy firm at a discount. What non-banking services does Eurobank provide? Eurobank helps SMEs to counterbalance their lack of specialised staff by offering non-banking services in key management positions. The bank identifies the areas in which its clients require specialised staff and selects the most appropriate partners to support their ongoing growth. Eurobank uses its bargaining power to secure discounts on such partnerships. The bank offers non-banking services in the tourism sector too, including: discounts on digital media, website and e-commerce development costs; revenue management consulting services for hotels; specialised training programmes for the hospitality industry, which can be taught both online and in person; and credit checking services on foreign tour operators for hotels and travel companies. Following the success of such non-banking services, Eurobank plans to expand its offering. What steps is Eurobank taking to help develop the export sector? For years, Eurobank has invested in the export sector. Success in this extremely competitive environment requires a long-term, consistent and collective effort. We support SMEs seeking to expand their activities abroad. Our main vehicle for this is Exportgate, an electronic gate to global trade and business networking. This is further enhanced by Eurobank’s strategic agreement with Banco Santander as part of the Spanish bank’s Trade Club alliance. Furthermore, in collaboration with a number of exporters’ associations, we organise Go International trade missions, which are structured business-to-business meetings that bring exporters and potential buyers together. A Go International trade mission will take place this November in Thessaloniki. In terms of banking products, we offer exporters an array of financial tools to support them in every step of their transaction cycle. Eurobank always aims to offer the most cutting-edge trade and supply chain solutions. It’s also worth mentioning that the bank was recently named Best Trade Finance Provider, Greece, in the Global Finance 2018 awards. How is Eurobank contributing to the digitalisation of Greek SMEs? Eurobank has made a strategic choice to embrace digital technology in a bid to become the premier digital retail bank in Greece. We aim to exploit the vast opportunities offered by technology and innovation to ensure absolute efficiency and an omnichannel experience for our customers. At the same time, it is our priority to encourage entrepreneurs to upgrade their businesses by offering simple, user-friendly digital solutions that will make a significant difference in their everyday activities. In 2017, we launched v-banking, a breakthrough alternative service channel, which offers a full banking experience through video calls. This innovative service channel assigns the client a relationship manager whom they can contact as often as needed, while also ensuring security, speed and technical functions to simplify everyday transactions such as cashing cheques and making loan applications. Companies that do not wish to visit physical branches can complete all of their banking transactions through this new channel.